.bashrc is a shell script that Bash runs whenever it is started interactively. It initializes an interactive shell session. You can put any command in that file that you could type at the command prompt. You put commands here to set up the shell for use in your particular environment, or to customize things to your preferences. A common thing to put in .bashrc are aliases that you want to always be available. then .bashrc won't run at all, since -c makes the Bash call non-interactive. The same is true when you run a shell script from a file. Contrast .bash_profile and .profile which are only run at the start of a new login shell. (bash -l) You choose whether a command goes in .bashrc vs .bash_profile depending on on whether you want it to run once or for every interactive shell start. If you put that in .bashrc instead, every time you launched an interactive sub-shell, :/some/addition would get tacked on to the end of the PATH again, creating extra work for the shell when you mistype a command. 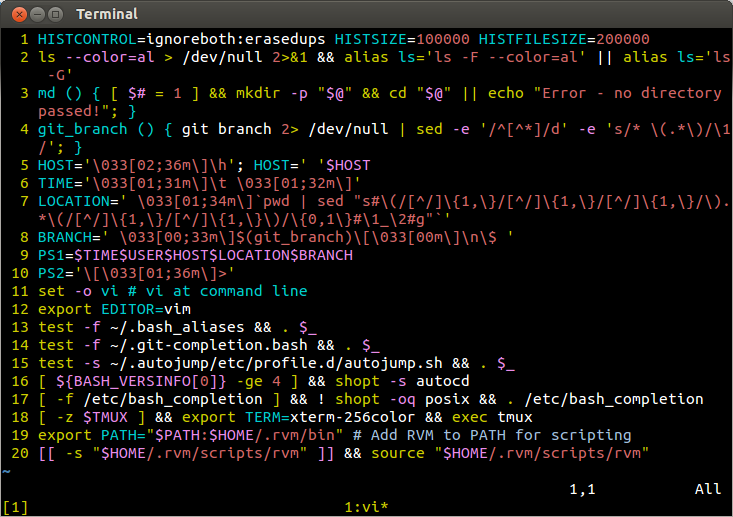 You get a new interactive Bash shell whenever you shell out of vi with :sh, for example. The purpose of a .bashrc file is to provide a place where you can set up variables, functions and aliases, define your (PS1) prompt and define other settings that you want to use every start you open a new terminal window. It works by being run each time you open up a new terminal, window or pane. -1. Set up my history file to ignore duplicates and be much larger than the default. -14. Execute my git tab completion script (for remotes and branches) if it exists. -20. Use rvm if it exists. I've made this portable so that it works on any of my linux or OSX machines without customization - hence a number of tests for presence are done before using certain functions and other scripts. This also makes it easier to use the entire file immediately on a new machine without having issues that affect opening a new terminal window. It is a bash config file. Simple illustration of how/when they are loaded is in the image below. After editing both /.bashrc and /etc/bash.bashrc the path is not in the environment. Why? When should I use .bashrc and when .profile? How Linux determines which bashrc file to load when there're multiple of them? What is the purpose of .bash_logout? What is the scope of environment variables defined in ~/.bashrc? What does bashrc PS1 check [ “$PS1” = “\\s-\\v\\\$ ” ] mean? how to pipe to a sourced function in bashrc file?